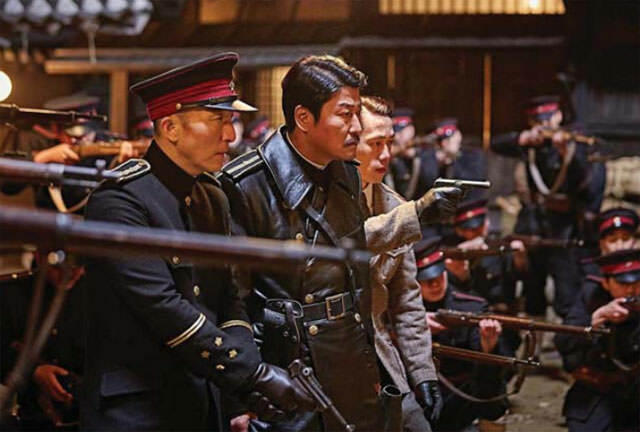 For those looking for something different to watch at home when there is nothing in the theatres except for a controversial Bollywood film and a tired sequel or two, the Korean film The Age of Shadows (2016) is now available in its noirish glory, all 140 minutes of it. Made as an ode to the resistance movement against the Japanese takeover over of Korea that stretched over decades in the early 20th Century, starting in 1910, the film tells the story of a team of committed fighters who will stop at nothing to release their beloved country from the possession of the haughty Japanese who rule over it, and part of China with an iron fist. The crux of the story is centred around several key figures including a resistance fighter turned policeman informant for the Japanese, Lee Jung-chool (Song Kang-ho). Lee’s allegiances are tested when he is cajoled and manipulated by the resistance fighters held together by the ingenuity and fortitude of a key figure, Kim Woo-jin (Gong Yoo), an antiques dealer who plays the game of suave businessman while organising for explosives and anarchist experts from Hungary to be smuggled from Shanghai into Seoul. Beautifully filmed with an attention to lighting and framing that echoes in the tradition of the great film noirs of the Hollywood studio system, the movie exhibits the sophistication of Korean filmmaking, underscored by great acting from the leads who take a complex, sometimes convoluted storyline and make it riveting by focusing on the strong, complicated personalities that inhabit the film. This is a story of heroism laced with an understanding of what it takes to be a resistance fighter; the film is strongest when the characters are showing their mettle, unflinching at the manipulations and hardships they have to endure in their fight for freedom. Entered by Korea for the Best Foreign Language category, but missing the nomination, this is a fine film out of a country that now produces gems of independent cinema, albeit, in this particular case, also supported by the behemoth Warner Brothers. World cinema has always pushed the boundaries of form all over the globe, and while The Age of Shadows does follow a hallowed Hollywood tradition, the film breaks boundaries in its depiction of good and bad, with Kang-ho’s character playing one of the most interesting, conflicted characters I’ve seen onscreen for a long time. It is a shame that films don’t pay more such attention to character development the world over, with Nepali films sticking to tropes that make you nauseous even watching the trailers, Bollywood films no less clichéd in their hackneyed renditions of men and women, and Hollywood, the great trend-setter and shaper of psyches all over the world no less lazy when it comes to portraying the complexity of people through our evolution. The Age of Shadows is a refreshing, grave portrait of a multifaceted set of people who are not blindly brave, making sacrifices that illuminate their humanity.